Monument Valley Iris Society had their 2017 iris show May 27th and 28th. LeRoy Meininger won Best in Show with the iris ‘Matters Of The Heart’. See the photo of the winning iris and learn about all the winners in this article from the Scottsbluff Star Herald. The Monument Valley Iris Society is having its Iris Show May 27th and 28th this year. The show is at the University of Nebraska Panhandle Research and Extension Center a mile north Scottsbluff on Hwy. 71. Find all the details in this Torrington Telegraph post. In addition to seeing all the great irises, there will be an opportunity to order irises for late summer delivery. Saturday May 20, 2017 is our Iris Show at St. Andrews Episcopal Church. Single entry iris and arrangements will be accepted from 9:00 AM to 10:30 AM. Judging at 10:45 AM. Open to the public at Noon. GOIS Board Meeting will be held later the same day. 1. Irises in a landscaped garden. 2. Irises in a field or home garden. 3. Events, tours, a person or people (at iris location). 4. Close up of an iris or irises. 5. Iris photos- art effects, macro of bloom segments. 6. Photos of pets, wildlife or garden art with the irises. Winners will be selected by popular vote of the viewing public. We will need volunteers throughout the day Saturday so please, please come and help. If you’ve already volunteered for a time slot, thank you and if you have not please consider doing so. The show is a favorite event for the public and a great source for new members. Linda Wilkie, GOIS President, sent this note which includes events that are of interest to other irisarians as well. The season has begun and most of you are enjoying the pops of color of the standard dwarf iris in your gardens. This Saturday we will be working in the Sass Memorial Garden at Mahoney Park to get it ready for the bloom season. Those who can are encouraged to come and help at 9:30 AM Saturday, May 6th. We want the gardens in tip top condition before the AIS convention May 23-27th in Des Moines. We’ve heard from many conventioneers who are planning a side trip out to the garden so your help is needed all through May. If you can take even one morning or afternoon to work out at the garden we would very much appreciate it. Don’t forget the other iris events this month as well. May 12-13 is Spring into Spring at Lauritzen Gardens. Ron Crampton is chairing that event and we are still looking for some volunteers. The Lincoln Iris Society is holding their show May 13th. We’ll have information regarding times and categories at our Monday meeting. May 20th is the GOIS Show. Entries are accepted from 9-10:30 AM and open to the public from 12:30-4:00PM. Show schedules will be available on Monday evening. Please contact me if you need one emailed to you instead. Looking forward to seeing you Saturday and Monday! A number of Region 21 members speak about irises to various garden interest groups. BJ Jackson spoke earlier this year at the Manitoba Horticultural Association Annual Meeting. Kris Jurik has been speaking to various Iowa Master Gardener groups. And Wayne Messer presented at the Cass County (Iowa) Master Gardener Spring Seminar. Both Gary White and Kelly Norris speak to a variety of gardening groups. Would having PowerPoint slides from such presentations be useful to you or your club? Maybe for presentations to your club or so you could speak to other groups. As an example, this is a series of slides, mostly dealing with the 2016 Medal Winners, from a presentation by Wayne. The link is to a PDF so you do not require PowerPoint or a similar program to see the slides. Please let us know what you think. You can leave comments below or email Wayne at wrmesser@gmail.com Thank you. This year Region 21 is hosting the AIS 2017 Convention rather than having a spring meeting. 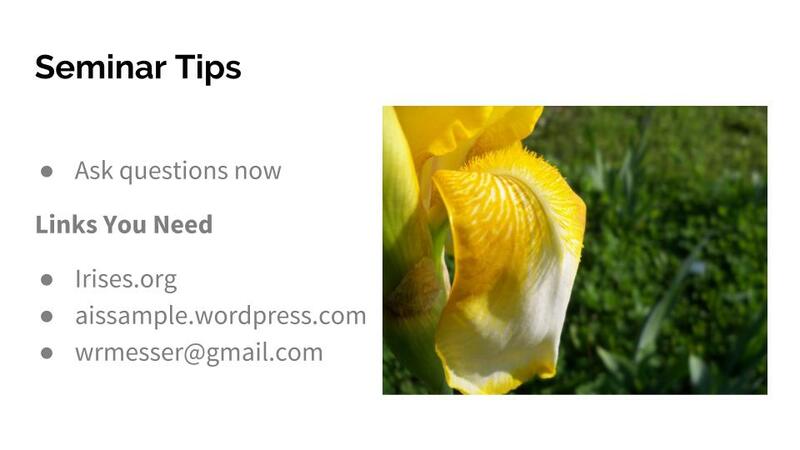 There are spring meetings in neighboring Regions to give you an additional iris fix. You can find all the spring meetings we are aware of on the Iris Encyclopedia here. The Region 9 Spring Fling Meeting is Saturday April 8th in Pekin, Illinois. Their website has the preliminary details. Contact them to learn more. The Region 18 Spring Meeting is May 19-20 in Columbia, Missouri. Here are the details and a registration form (PDF) for you. Enjoy these events and hope to see you in Des Moines for the Convention!